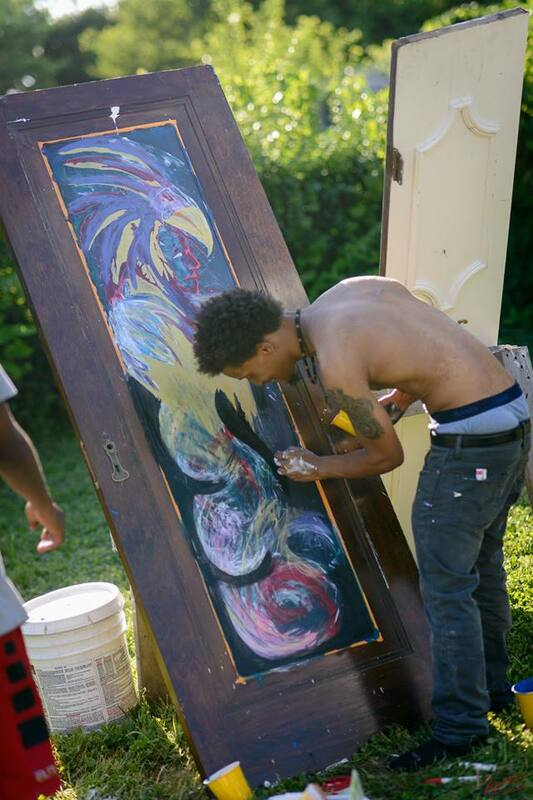 Though 26 years old, Jamahl Crouch has been a freelance artist since he was 16 years old. His goal is to try to make art an economic resource to live on because art is what he wants to do. Who he is. His family background includes his Uncle Aaron, who was career military; his grandmother, who was a third grade teacher; his aunt, who was a prosecutor; his mom, who was a paralegal; and his dad, who was a comedian, show host, and DJ. Sitting around soaking up knowledge from them was huge. He started drawing at a young age and graduated high school knowing that he wanted to make art. Determined to get the training to allow him to make a living at art, he attended Vincennes University. It was a smaller school, but he had lots of one-on-one interactions and he had a chance to see artists who had made it. The dream became real to him. After Jamahl received his Associates in Fine Arts, he returned to Indianapolis, moving to 13th and Delaware, so he could go to school at IUPUI’s Herron School of Fine Arts. He thought he had it made at this point, but then he realized that the debt was crushing him, defeating the purpose of an artist’s lifestyle. He began to work off his debt while trying to go to school. He worked a series of jobs: Blaze Pizza, a gas station, door-to-door sales (which taught him how to establish connections, network, and how to engage people in conversation). This way of living stretched him very thin, as he ended up sleeping away any free time he had. His life was work, school, and sleep, with no time for any outside social interactions. Ended up working with another local artist, Kevin West. One of his biggest inspirations: seeing someone do their art, flourish in doing it, and teaching others. Kevin took Jamahl on as a partner in his start up company. Jamahl’s takeaway lesson was how Kevin focused on what he loved doing and didn’t allow anything to distract him or take him away from that. Kevin was a mentor, giving him pointers in how to promote himself and what it meant to be an artist looking out for another artist and inspiring others to do it.